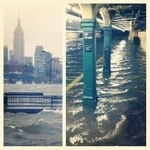 The city I love was hit pretty hard by Hurricane Sandy. I’ve lived here my whole life and never have I seen anything like this before. The entire tri-state area–New York, New Jersey and Connecticut–as well as areas from North Carolina all the way up north through New England saw devastation and damage, loss of lives, homes and personal property. I feel incredibly lucky that my family is safe, warm and together having weathered the storm unscathed. Not everyone was as lucky and my heart goes out to those who have woken up this morning to a life phenomenally different than it was just 48 hours ago. If you too were fortunate, please join me in donating to the Red Cross-no amount is too small.